Coffee, donuts, fresh fruit, bottled water, free tire pressure and oil check provided. Click the link HERE to see the route to the camp site. Suggested engine size requirements to keep up with pack: 500cc and above. Any brand or style of bike is welcome! Gas stops: 2 gas stops. One in Rancho Cucamonga and one in Cabazon. arrive at 8am at Thousand Oaks Powersports with a full tank of gas. We will be providing coffee, donuts, fresh fruit, and bottled water. Riders will also receive a $20 gift card to Thousand Oaks Powersports and other little goodies to help make your weekend better! 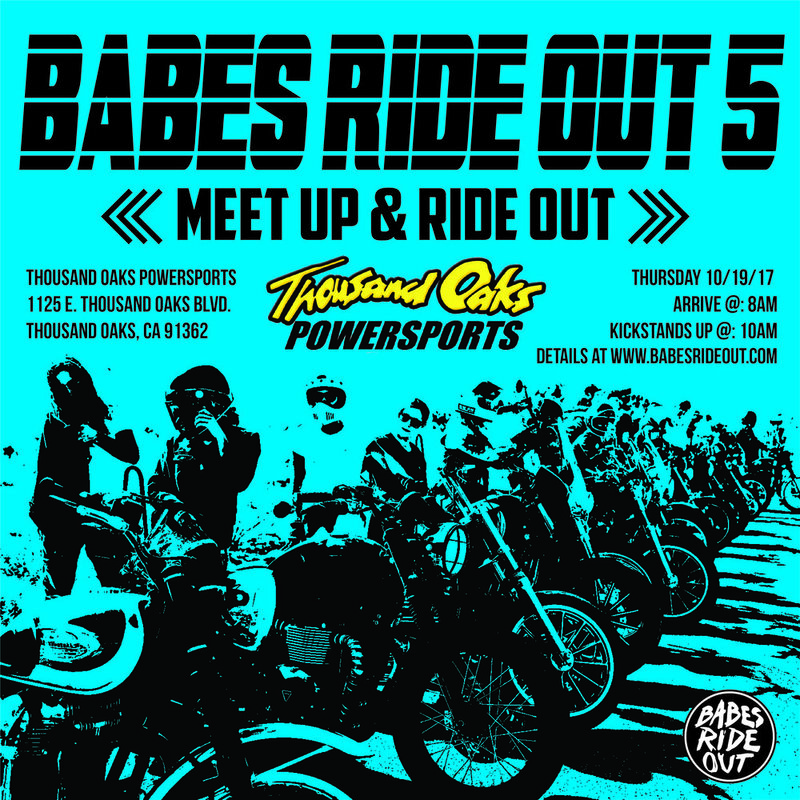 Thousand Oaks Powersports is giving a 15% discount from August 22nd, 2017 to October 27th, 2017 for anyone attending Babes Ride Out 5. Between now and October 18th we are also offering free labor on oil changes and a 25% discount on labor for tire changes! (15% off tires and 25% off installation). Please make an appointment for service at our T.O. 2 location. (805) 497-3765 Option 2. Please R.S.V.P. to mark@thousandoakspowersports if you're planning to ride out with us! We may be joining up with other groups along the way. It all started with a love for motorcycling. TOPS started in 1969. Back then we were known only as Thousand Oaks Yamaha, after the sole line that we carried. After years of watching the industry boom, we picked up Kawasaki in 1984. In 1988, we were hand-picked to be the only KTM dealer in all of Ventura County. We have always had a strong involvement in amateur motocross, and with the additions of Kawasaki and KTM, our amateur teams rose to championships and our shop started to grow. A new chapter in our history was opened with the addition of Triumph, the legendary British marque, in 2014. In the mid-80’s Jef Harriot took over Thousand Oaks Yamaha and, with the help of two of his customers, turned it into Thousand Oaks Powersports. Jef was a professional racer and his vision was to develop a unique powersports business fueled by his passion for racing. The business spent twenty-four years in a three thousand square foot building. It was here that Jef built tremendous customer loyalty and received national recognition for his amateur race team. In 2009, we expanded from our little shop on Thousand Oaks Boulevard to our current, 15,000 square foot location just a few blocks away. In 2015 we purchased the Piaggio dealership down the street where we carry Aprilia, Moto Guzzi, Piaggio, and Vespa. Today TOPS provides Motorcycles, Scooters, Side x Sides, ATV’s, parts, garments, accessories and repair services to the community. We separate ourselves from competitors by paying intense personal attention to customers, and by educating customers about the products they need or desire. We offer creative programs to reward customer loyalty and provide on site repair services for the items sold. It is the vision of the company to offer quality products and exceptional service in a warm, family-oriented and friendly environment. One of the best things about the TOPS staff is everybody rides. From the owners on down we all love to ride. We also like to help each other cross over into different disciplines. You’re a motocross rider? What is your favourite track? You are a street enthusiast looking at taking it to the next level? Let's go do a track day. You’ve never ridden dirt? Let’s go trail riding or hit the desert. This spirit is what keeps things fun and grounded in our company. We love to be involved with our community as well. Whether it's through sponsoring local motorcycle clubs, working at fairs, or raising money for charity. We support our local racers too, so no matter what level you ride at, we want to help you achieve your goals. Our commitment to amateur motocross has made our team a winning force that can proudly name alumni like Mike and Jeff Alessi, Josh Hansen, Josh and Justin Hill, Cole Seely, Andrew Short, and even former Supercross Champion Ryan Villopoto. We also sponsor several amateur speedway and flat track racers like Grant Holmes and Travis Petton. We’re excited and proud to continue our support for Babes Ride Out and Babes in the Dirt. We’re seeing more and more women getting into motorcycling. Being more involved with Babes Ride Out and Babes in the Dirt has given us a chance to understand the needs and desires of women riders so we can be better at providing solutions to our customers. Motorcycles don’t know gender. That’s a phrase we’ve been using a lot around here. It’s been refreshing and inspiring to see more and more women break through the stigma that riding motorcycles is only for men or women can’t be as talented as male riders. That couldn’t be further from the truth. We want to help create the independence and empowerment we’ve seen in so many women motorcycle enthusiasts. The increase of women getting into riding has brought new passion and life into our sport. Women are doing so much for the advancement of motorcycling. Events like Babes Ride Out and Babes in the Dirt are responsible for creating so many new riders and introducing veteran riders to different types of riding. It was really cool to see so many women at Babes in the Dirt 3 ride a dirt bike for the first time! We’ve also had women buy their first motorcycle and learn to ride just so they could attend Babes Ride Out. Those same riders are now deeply passionate about riding. Being a grassroots shop is how we started and even though the shop has grown in size we still believe in the grassroots of our sport. It’s this attitude that makes our customer’s feel like family. Our passion is to inspire people to have fun on any kind of motorcycle. That is what it’s all about, a love for riding motorcycles and having fun with friends. This year we are going to be leading a ride from our shop to Babes Ride Out 5. TOPS employee Dani Diaz will be leading the ride. Dani is a trained motorcycle technician and is one of our service specialists. If your bike isn’t working Dani is the person to call. Dani loves riding track days at Chuckwalla, Willow Springs or Buttonwillow. She’s looking forward to meeting everyone at Babes Ride Out and making a whole bunch of new friends. That’s what it’s all about, having a few laughs with friends and a love for riding motorcycles.